As an art history major in my former (and more and more distant!) college days as well as a lover of children's literature, I am inevitably drawn (no pun intended!) to picture book biographies of famous artists. 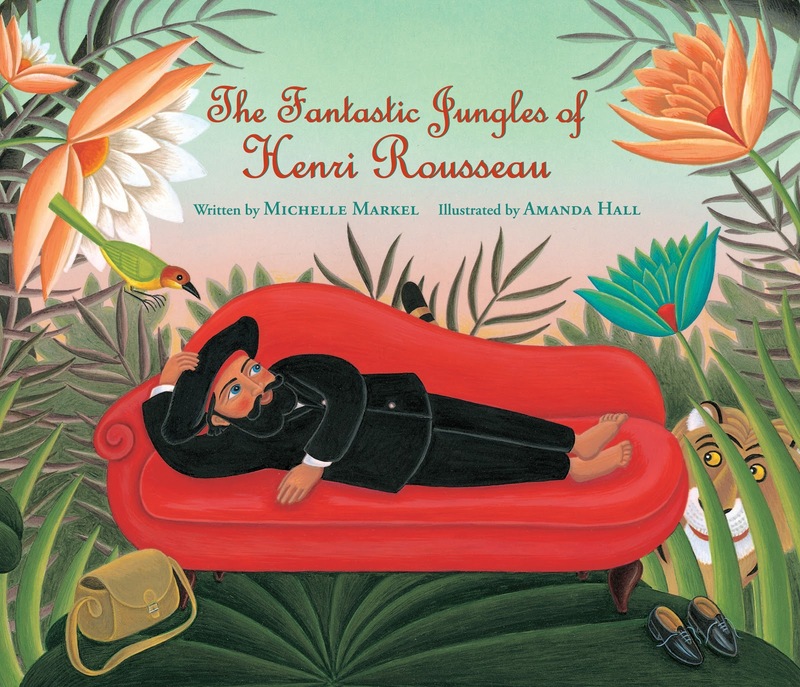 The life and art of French artist Henri Rousseau are vividly brought to life in a recent release by author Michelle Markel and illustrator Amanda Hall. Rousseau is best known for his post-impressionist paintings depicting jungle scenes, although he never left France. 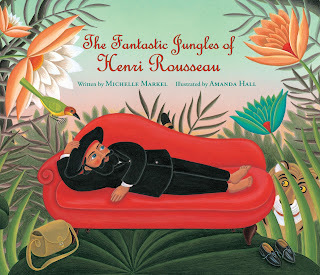 Rousseau, we learn from Markel's succinct yet poetic text, wants to be an artist, even though he is 40 years old, a toll collector, and has never had any art training. "Why? Because he loves nature. Because when he strolls through the parks of Paris, it's like the flowers open their hearts, the trees spread their arms, and the sun is a blushing ruby, all for him." With no money for art lessons, Rousseau studies the paintings at the Louvre, photographs, illustrations, animals at the zoo, and leaves, plants and flowers from the local botanical garden, where he is particularly enraptured by the tropical plants. Although his work is ridiculed by the art critics, Henri perseveres, spending all his money on art supplies and supplementing his income by giving music lessons. Although the art establishment continues to belittle his work, several younger artists, including the already well-known Picasso, eventually recognize his talent. Now, of course, his paintings are in museums world-wide, and he is recognized as an artistic genius. The illustrations by Amanda Hall pay tribute to Rousseau's "primitive" style, with its flattened shapes, vivid colors, detailed leaves and plants, and unusual perspective. Many of the illustrations draw directly on Rousseau's paintings for inspiration, and adults will recognize some of his most famous works such as "Sleeping Gypsy." Even the endpapers echo Rousseau's easily recognizable style, with its jungle leaves, flowers, and animals. To better emulate the feel of Rousseau's paintings, Hall worked in watercolor and acrylics. She also incorporates some of his famous friends into her illustrations, and in the afterword a key is provided to see who is who in those spreads. I would have liked to see some reproductions of Rousseau's actual paintings in the afterword, but these can easily be found online for those who would like to explore further the fascinating works of this self-taught artist. Newbery-award winning novelist Karen Cushman is an expert writer of historical novels for youth, and is particularly drawn to tales set in "merry old England." I use this phrase a bit ironically, since one of the features of Cushman's writings is that she does not shirk from describing the hardships of life at that time, particularly for those children in the lower classes. Her newest book differs from all her past novels by featuring a boy as a protagonist rather than her usual feisty girl heroines. "Will Sparrow was a liar and a thief, and hungry, so when he saw the chance to steal a cold rabbit pie from the inn's kitchen and blame it on the dog, he took it--both the chance and the pie." We learn that Will, not yet thirteen, has had a hard life, having been sold by his father to the innkeeper for free ale. 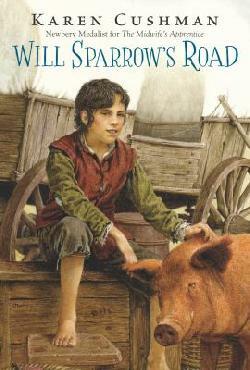 With the threat of being once again sold to London to be a chimney sweep, Will runs away, preferring the dangerous life on the road, in which he must scrounge for food and some kind of shelter from the cold,` to a sure early death as a "climbing boy." What kind of future faces our hero, besides an empty belly? Will meets up with all kinds of colorful characters on his travels in Elizabethan England, including a quack of a doctor who recruits Will to serve as his stooge, a blind juggler, and a cranky dwarf, and quickly learns to trust no one. Will manages to attach himself to a group of entertainers who perform at fairs, an Elizabethan freak show that includes a unicorn skull and a sea monster. He even makes a few friends, including Duchess, the world's smartest pig, who performs tricks and even is learning to understand French, her owner, Samuel Knobby, and Grace, a young girl with a hairy face who is billed as a live monster in the show of wonders. As we might expect in a book for young readers, Will, who is friendless and penniless at the beginning of the tale, ultimately finds a family of sorts, one of his own choosing, among the misfits of the fair. I have to say that this was not among my favorite of Cushman's novels; the story simply didn't engage me the way Midwife's Apprentice, The Ballad of Lucy Whipple, and others of her work have. I'm not sure exactly why, but I think that the story is not paced as well as some of her other books and I was not as drawn to the character of Will as to some of her earlier protagonists. As always, however, she is skilled at creating an authentic historical setting, and the reader is drawn into the world of the Elizabethan fair, including its smells and sounds. She liberally sprinkles her text with Elizabethan-sounding phrases, such as "certes" to provide some local color as well. While this book is likely to appeal to those youngsters who are drawn to historical stories, I would be more likely to recommend others of Cushman's titles to a young reader before this one. 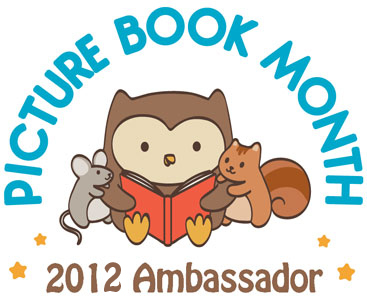 Here at the Fourth Musketeer, I am highlighting new historial picture books in honor of National Picture Book Month. Authors Mary Tavener Holmes and John Harris seem to be expert in finding true but quirky animal stories from long ago to bring to new audiences via the picture book format. Following their charming picture book A Giraffe Goes to Paris is this new account of an unlikely friendship between a very rare albino elephant and the Emperor Charlemagne in medieval Germany. This improbable but true story is told in the voice of a monk who chronicled Charlemagne's life in the 9th century. 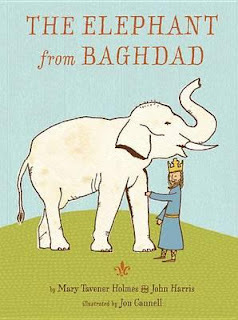 The elephant, Abu, was a gift from Harun, the caliph of Baghdad, a great Muslim leader whom Charlemagne sent emissaries thousands of miles to meet. Evocative two-page spreads show the magnificence of the city of Baghdad, with its beautiful buildings, libraries, scholars, and golden palaces with peacocks wandering in the gardens. When the Europeans finally set off on the long journey home, they carry many fine gifts from the caliph to his fellow ruler, including a magnificent clock. But the most magnificent gift of all was the elephant Abu, who led a caravan filled with treasures. Upon arriving in Germany, Abu and his keeper were invited to live in Charlemagne's palace, and his image began to appear throughout Charlemagne's empire. He even wore armor and was led into battle! Holmes and Harris write their story so that no prior knowledge of Charlemagne or this period of history is required to appreciate this fantastic tale. As in their earlier book together, this book skillfully combines watercolor and ink illustrations with photographs of historical medieval art works. It's an excellent friendship story for animal lovers or those interested in history. An authors' note gives further information on the monk Notker the Stammerer, who they imagine narrating the story, as well as background on the elaborate mechanical clock given as a gift by Harun to Charlemagne. Unfortunately, the clock no longer exists. The note also provides information on the sources used to research and write this story. 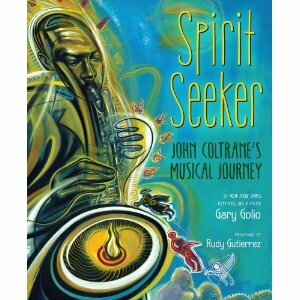 National Picture Book Month is the perfect time to highlight this new book by author Gary Golio, who adds John Coltrane to his growing collection of picture book biographies of musical greats. Earlier books, reviewed here on the Fourth Musketeer, profiled Jimi Hendrix and Bob Dylan. While these musicians might not seem like typical fodder for children's picture books, this format, with its striking and inspirational illustrations, is in fact ideal for stimulating young people's interests in these iconic musicians. The book's title page features the following quote from Coltrane: "My music is the spiritual expression of what I am...I want to speak to their souls." We first meet John Coltrane as a young boy, in North Carolina in 1938, listening to his grandfather preaching on a Sunday morning about the power of the Spirit. John's life was "like a little slice of heaven," with plenty of food, games, and a loving family surrounding him. His father, an amateur musician, filled the house with his singing and tunes from his ukulele and violin. But at the age of 12, John lost his two grandfathers, his grandmother, and his father in rapid succession. Turning to music for consolation, he was fortunate to receive a used alto sax, which he soon took everywhere, practicing for hours and hours. Moving to Philadelphia, he began playing with big bands and blues groups, and absorbing the music of jazz greats like Charlie "Bird" Parker. Although he was achieving success, life on the road was lonely, and John turned to alcohol and drugs for company, turning away from his spiritual underpinnings. Soon "he had to choose, between the dead end of drugs or a life rich with music." Will he find the strength to get clean and regain his inspiration? Golio's narrative features Coltrane's spiritual journey front and center, in which he used music in his attempt to "unlock the mysteries of life." Coltrane's spiritual explorations culminated with his masterpiece, A Love Supreme, which Golio poetically describes as the "song of the human heart reaching up to heaven." In addition to being an accomplished author, Golio is a licensed therapist who specializes in treating addiction problems, which may be part of the reason he feels comfortable interpreting the stories of musicians such as Coltrane and Hendrix for young people. The book's afterword includes a note on musicians and drug use, in which Golio explains that while musicians are no different from other people who use alcohol and drugs to deal with their emotions, they may be even more vulnerable to addiction due to the demands of touring and performing and the belief many artists have that drugs can make a person more "free" or "creative." Golio has a gift for expressing music with words, just as Coltrane turned feelings into sounds. 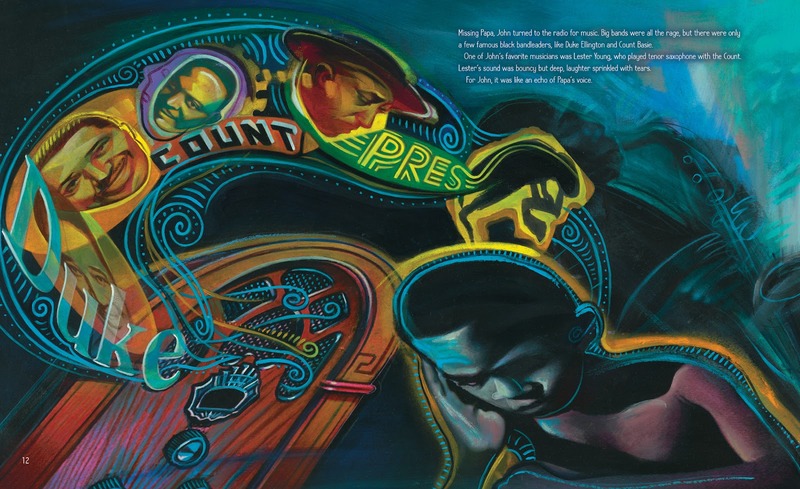 But it is impossible to discuss this work without highlighting the outstanding illustration by Rudy Gutierrez, a Pura Belpre Honor-winning artist who has also designed album covers and clearly has an affinity for music. In an artist's note, he explains that he fasted for two weeks and meditated, much as Coltrane did when he composed A Love Supreme, to seek inspiration for illustrating Golio's tribute to Coltrane. The illustrations include acrylic paintings and mixed media pieces done with colored pencils, crayons, and acrylics. The dream-like compositions, dramatic movements and use of contrasting and complementary colors evoke the energy of Coltrane's music. Many of the spreads from the book can be seen on Gutierrez' website. For more on this book, check out Gary Golio's interview in School Library Journal at this link. 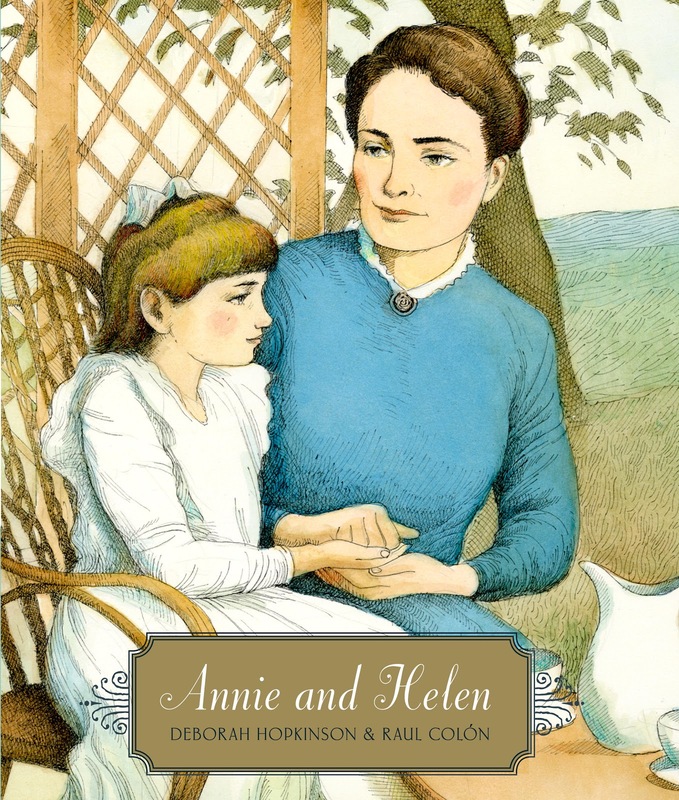 While there are many, many books about Helen Keller targeted at young readers, Deborah Hopkinson and Raul Colon have added to these riches with a lovely picture book biography that focuses on the intense relationship between Helen Keller and her teacher, Annie Sullivan. Hopkins intersperses her narrative, which begins on the day when Annie Sullivan came into Helen Keller's life, with excerpts from Annie's own letters to her friend and former teacher, Sophia Hopkins. We see Helen throwing a violent tantrum, her dog running away from her: "Helen was like a small, wild bird, throwing herself against the bars of a dark and silent cage." But Annie, who fought her own battle against blindness, understood that Helen needed discipline, and "prepared for battle." She and Helen moved into a small house on the family's property, and Annie helped Helen accept rules and teaching. But how could she teach her language? Hopkinson explains the manual finger alphabet used by Annie, and provides drawings of the hand positions for each letter in the text as well as explaining how Annie tried to teach Helen the names of familiar objects. When Helen finally grasps the concept of words at the water pump, as cool water splashed on her hand, the world of language quickly opened up to her. Sullivan writes about Helen on April 5, 1887: "A new light came into her face." Hopkinson shows us Helen as a very bright child, giving many examples of how she put together words. We even see Helen running and jumping with joy on their walks. Annie also taught Helen to read using Braille and how to write using a special braille typewriter. The book concludes with a letter written to her mother on a short trip with her father. The book is beautifully illustrated by award-winning artist Raul Colon, whose gentle, water-colored earth-toned illustrations capture the special relationship between these two remarkable women. Back matter includes a few suggestions for further reading and a selection of websites to learn more about Annie and Helen. Endpapers feature some of the many photographs of Helen and Annie. The author also includes an author's note, which provides some basic biographical information on both women. 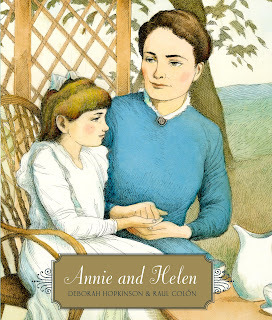 I would highly recommend this picture book to share in a classroom or at home; it only covers a brief period in the relationship between Helen Keller and Annie Sullivan, but this book could easily be supplemented with other volumes for those young people who want to learn more about this famous teacher-pupil relationship. Last year was the inaugural year for the Picture Book Month celebration, and events were held throughout the world celebrating the importance of picture books for all ages. Sadly, many parents feel as soon as their kids can read chapter books, they are too old for picture books. Nothing could be farther than the truth! Take this month to recommend some great picture books for all ages to kids in different age ranges. Unfortunately, I believe that the growth of Accelerated Reader in the schools has added to the problem, since picture books only give ".5" credit, despite the fact that they may have more sophisticated content than chapter books. 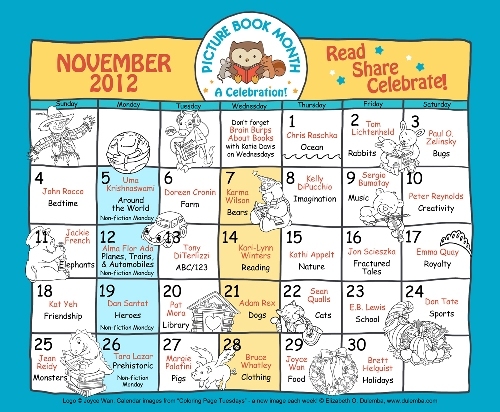 The website, PictureBookMonth.com, features essays from “Picture Book Champions. Each day in November, a new essay is posted from a different author, a similar format to the Kidlit Celebrates Women's History Month blog that Lisa Taylor and I have organized the past few years. 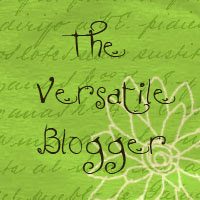 A downloadable promotional kit is now available as well as certificates, posters, and bookmarks. 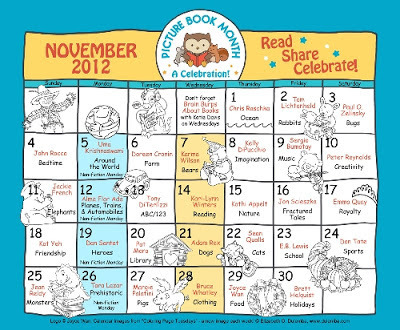 Join the celebration by visiting www.picturebookmonth.com and by promoting picture books this month! Below is a calendar of the all the authors who will be included.